Dishing out fresh measures to develop the plantation sector the Government has earmarked Rs.2 billion for a fertiliser subsidy and planned fresh restructuring of State owned plantations and factories. Plantation Minister Naveen Dissanayake yesterday dismissed speculation that the Government would roll back its fertiliser subsidy for small holder tea, rubber and coconut plantations, insisting that they were in talks with the Treasury to provide Rs.2 billion in funds. Under the present discussions with the Treasury smallholders with a hectare of land or less will receive Rs.12, 000 for tea, Rs.10, 000 for coconut and Rs.5000 for rubber. “We are trying to increase this amount to about Rs.2.5 billion. Thereby providing tea smallholders with Rs.14, 000, coconut Rs.8, 000 and rubber Rs.5000. However we will ensure that this money is sent directly to the accounts of the plantation owners so they can purchase the fertiliser they prefer. We are committed to ending the irregularities and corruption linked to the fertiliser subsidy,” he told reporters. The Minister on Tuesday also signed off on a Cabinet paper to restructure the Tea Shakthi Fund, which currently runs only three tea factories. Of the eight factories that have closed over the years the Ministry wants to restart five. The Cabinet paper has proposed allowing private sector investment to five of the eight factories in a transparent manner, he said. 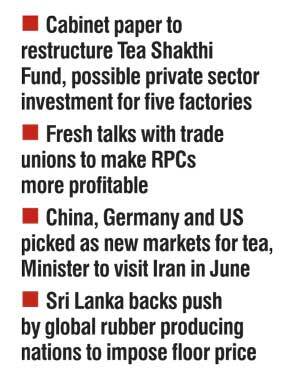 Talks with trade unions have also begun as the Ministry looks to restructure the Tea Shakthi Fund, which the Minister described as being the “weakest institution under my purview.” A plan to restructure the fund is expected to be rolled out within the next two months. He also stressed that loss making Regional Plantation Companies (RPCs) will be encouraged to submit plans on measures to improve productivity and efficiency. Dissanayake staunchly defended current tea auction prices and went onto explain that the Government would work to increase tea exports to China and Iran with the Minister undertaking a visit to Teheran in June. China has also been picked as a potential new market by the Tea Board, which will also use part of its $50 million global marketing budget this year to popularise tea in the developed markets of Germany and U.S. The latter destination was picked due to strong tea demand from millennials. Rubber prices that have dipped due to the drastic reduction of oil prices may pick up as world oil prices increase marginally, the Minister said, adding Sri Lanka was supporting a measure by the Association of Rubber Producing Countries, to establish a floor rate. “Once the floor rate is established each kilo of natural rubber will receive a price of about Rs.250, which is expected to be introduced in the next few months. We are confident the rubber prices will improve significantly once this is done,” he said.